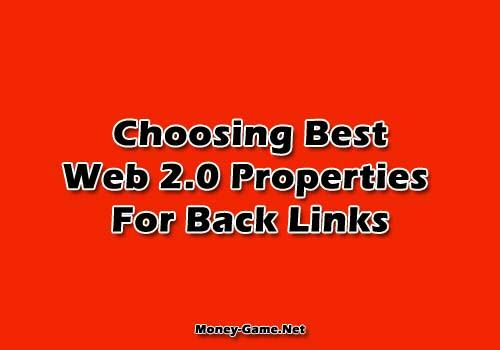 How to choose best web 2 properties for backlinks ? This is a question repeatedly ask in seo forum or web master forum. Probbly it only second to the threads asking for Best Web 2.0 Property List. Those web 2 lists are everywhere and you can see most of those have 100s of sites. Now the real question is all these sites will work for you ? Simple answer is Not Really. Well lets think about how you would create a high quality web site using these properties. If these are for getting back links for your money site then you would use good unique content. Then you would keep adding new content and also create a good backlink profile for these too. You would be using your time and money to build these because you are looking for good result. Which means high quality back links to your money site from these. But what if your web 2s vanish after a while ? all your hard work and money invested would be wasted. There are different type of web 2 sites. There are popular popular free blog sites like Blogger.com, WordPress.com, Blog.com etc. Then there are lots of not so popular similar sites. One of the most important things is how long these sites will last. Because everyday we see sites close their operations and die. You might able to salvage content you used but all the time and money use invested for those would be lost. This is why you shouldn’t pick those new or not known sites for your first layer. We have same problem with blogs we create at free web hosting services. I used to love it but then I realized how bad this could be. Free hosting services come and go. Even those best out there might be closed. I have one WordPress blog as one of the best free web hosting providers (Used to be) but now I worry because looks like provider is going down the hill. Owner is rarely seen in forum and no longer accept or activate new accounts. Also sometimes their free sub domains never get indexed in Google. So now I avoid free web hosting as web 2 sites for back-links no matter how promising those look. It’s find to keep those as second option with maybe spinned content. But don’t put too much work or keep too much faith on those. This doesn’t mean free hosting is bad for everything. If you can use your own domain names then those would be great. Blogger.com – The best one out there. You can even use ads if you don’t spam. WordPress.com – Probably the second best. Weebly.com – another good one. These five are very easy to use and last long. They don’t remove sites because of inactivity. Also provide do follow back-links which is our main target. But if you want these to index fast then you do add all of these some back-links. Don’t have to be high quality but don’t blast too spammy links either. Shouldn’t add too many out bound links but all out bounds links shouldn’t be towards your money site either. Add links to other sites too. Better picks sites which are none competitive and not in same niche or high authority sites like Wikipedia etc.